Ok we don't have tv, well.... we do have a large screen but we only watch movies- no cable for us. Which means that some times I am downright happy and sometimes completely out of the loop. Yes, we watch Mad Men, Glee, Project Runway and Ugly Betty- but when it becomes available on Hulu and Netflix. When I see all of you tweeting about the newest episode of glee I must admit I get downright jealous- yes Grace this means you! And though I have seen Oprah it has been while waiting in some public place that has a tv on. So I am came late to Nate Berkus. 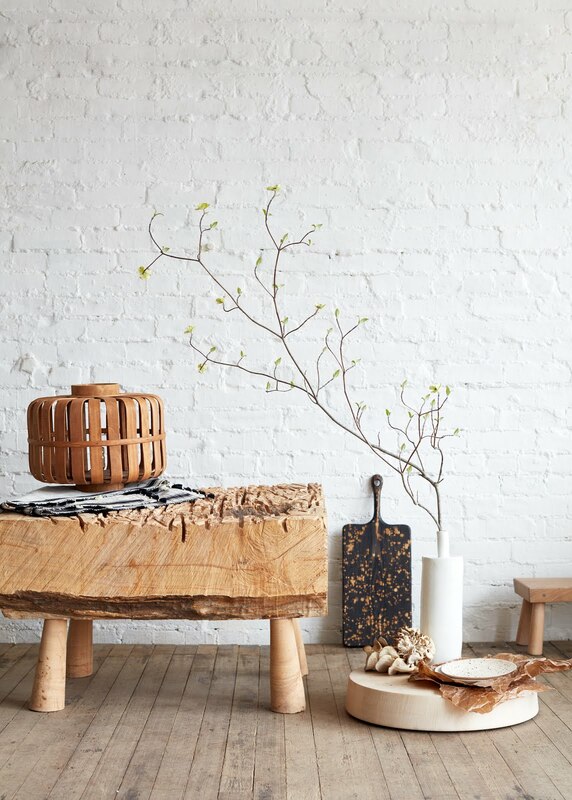 I have seen his work in Elle Decor, and Domino ( tears for Domino inserted here ) and love his simple clean style. 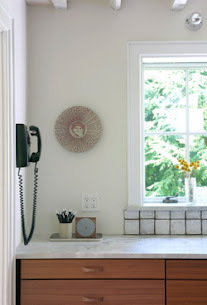 Well today is Nate Berkus day thanks to Julieann at Create Girl and the Moggit Girls, so after checking out my post hop over and see what some of my friends think of his work as well. My fantasy is to have big steel windows- even though my very (sometimes too) practical architect husband keeps reminding me of the A. cost, B. fact that they are not very well insulated and C. that every job he has seen them installed on has had moisture problems. At least in our climate. Ok, ok I hear ya honey but still a girl can dream. So when I fantasy Pied a Terre in NYC I will call Nate and this will be the starting point for my kitchen. 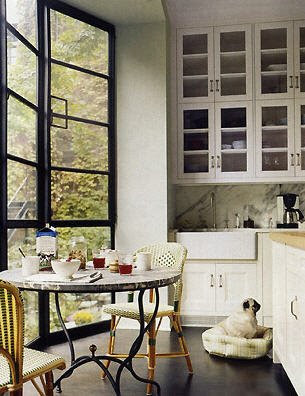 I can just see myself peacefully having my morning cup of tea with my pup right here! Or maybe on the terrace outside through these doors. Design problem number 2- we have one full bath for the 4 of us with a single sink in it. Def. time for an upgrade as 1 teenage girl and one about to be teenage girl plus mum and dad jostle for sink time in the am. 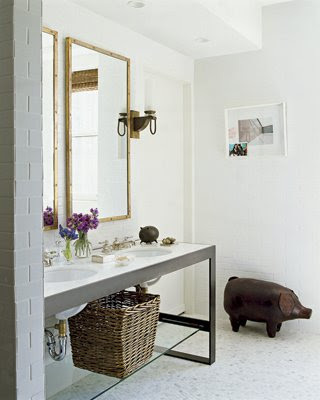 I love the clean lines of the sink below, and my pig lovin daughter would be thrilled to have the sculpture in the corner. Peace restored. Lately I have been lamp shopping for the house, time for something new and exciting. I did find a great vintage piece at the Rhinebeck Antiques fair a few weeks back and as soon a sI get it installed will show you all it's fabulouseness. We have 2 perfectly nice Ikea floor lamps next to our couch, but as will happen to Ikea stuff after a while they are getting a bit wonky. So time for something new. I really want something oversized like this amazing piece below, my problem is a lack of space. So I guess I will save that for my pied a terre as well.... sigh. Well perhaps the one Nate inspired change I can make is a big graphic black and white striped rug. I will keep you all posted.